It is easy to get ready for Christmas Entertaining. Christmas is one of the most festive holidays of the year, so you should start your planning early in order to make sure it’s going to WOW your guests. Bringing friends and family together over the holidays makes for a warm and special time. Christmas is a time for being with each other, sharing stories, food, and laughter while celebrating the holidays. Christmas Entertaining can seem a little daunting, however, it can also be a lot of fun. Here are a few tips for making this day one you can enjoy and share in all the festivities. There are hundreds of ways to update and transform your home. Add a little shimmer and shine or go with festive red and greens. We’ve provided plenty of inspiration to help. From stunning table arrangements to items to create a festive front door. Layer cozy beds with holiday bedding to infuse warmth into your space from the harvest season through to the new year. Faux floral and pre-lit arrangements add a special touch that reflects holiday cheer. Put a twist on your holiday traditions, and go mad for plaid. Make your guestroom or master bedroom festive by swapping out the everyday bedding with a duvet featuring a classic plaid pattern. Wreaths are more than door decorations. Give Christmas Entertaining a modern makeover by pairing oversized wreaths with a mirror in your entryway or living room. Incorporate plaid bows, faux berries, and natural pinecones. Browse through an extensive collection of Christmas pillows, wreaths, ornaments and faux potted amaryllis and get ready for Christmas Entertaining. If you’re looking for fun ideas on different types of cocktails to serve to go to Earth Gear’s Best Cocktail Recipies. If you’re looking at making stocking up your bar with all the necessary tools go to Earth Gear’s Bar Accessories. Just remember to drink responsibly. Add a festive touch to cocktails with our joyful double old-fashioned glass. 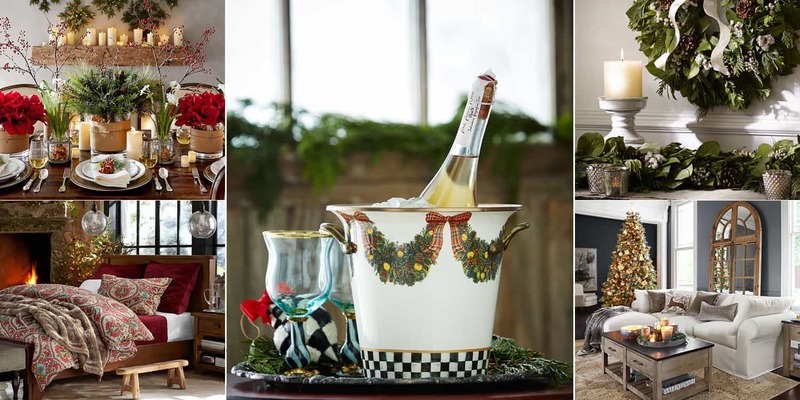 A charming holiday gift, it features a hand-applied rim and decals made with 24-karat gold. Crafted of clear, sturdy glass, it showcases cocktails beautifully and is just as eye-catching when presenting water, milk or iced tea. Present and serve fine spirits in style with our vintage-inspired decanter, which combines a light-catching pattern with a deep blue hue. The Regency-era geometric pattern is cut entirely by hand, making it an inspired choice for holiday gatherings and special occasions all year long. The soft color and intricate texture of natural birch gives these flameless candles their autumnal charm. Their flickering light mimics a real wick for an authentic glow. Candlelight flickers merrily through these hand-punched snowflake lanterns. Made of terra cotta with a glazed finish. Iron handles make these easy to transport and add a decorative touch. The soft neutral colors and intricate texture of natural birch add a peaceful woodland feel to seasonal decorating. Our Birch Tree is accented with jute rope at the tip for a rustic contrast and is lit with tiny lights for a warm glow. Place it on a console or mantel as the centerpiece of a display, or group a few in different sizes for added height and drama.